Which Shaivite sect believes God is the operator of the Universe but not the source? As I discuss in this question, by far the most popular school of Hindu philosophy is the Vedanta school, which bases its tenets on the doctrines laid out in the Brahma Sutras, a work by the sage Vyasa that summarizes and systematizes the philosophical teachings of the Upanishads. You can read the Brahma Sutras here. For the Lord there can be no creatorship, for that leads to incongruity. And (the incongruity arises) because of the impossibility of a relationship. And (the position is untenable) because of the impossibility of (Nature) coming under (His) direction. (Or) And (God cannot be proved), since no physical support (adhisthana) is possible for Him. Should it be argued that God will direct Nature like (a man directing) the organs, then it cannot be so, for that will result in God’s having experiences (of happiness, sorrow etc.). (Or) If a body, equipped with sense-organs, be assumed for God, (we say that) this is not possible; because of (consequent) experiences etc. God will be subject to finitude or loss of omniscience. Now most commentaries on the Brahma Sutras, including Adi Shankaracharya's Brahma Sutra Bhashya here and Ramanujacharya's Sri Bhashya here, interpret these Sutras as (in part) a refutation of the views expressed in the Shaiva Agamas, aka the Shaiva Tantras. 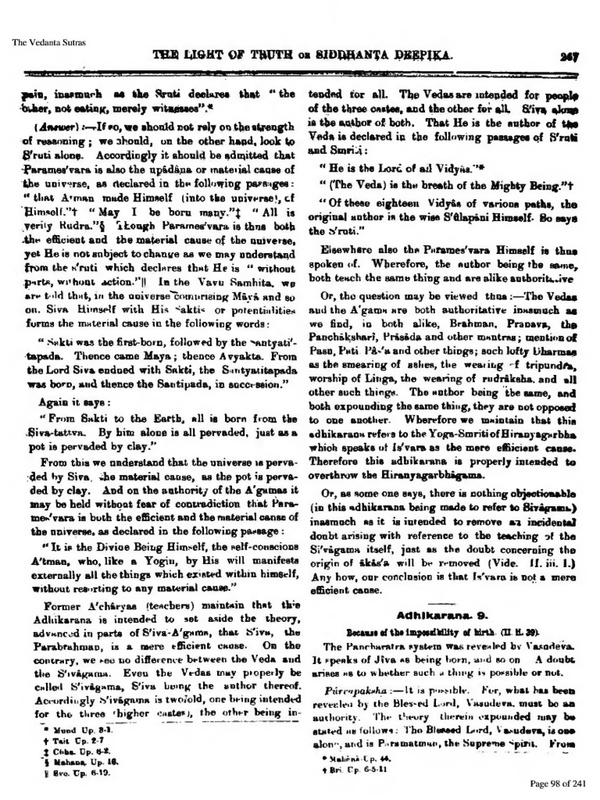 But I found one commentary, the Srikantha Bhashya which you can read here, which has a very different perspective on things. 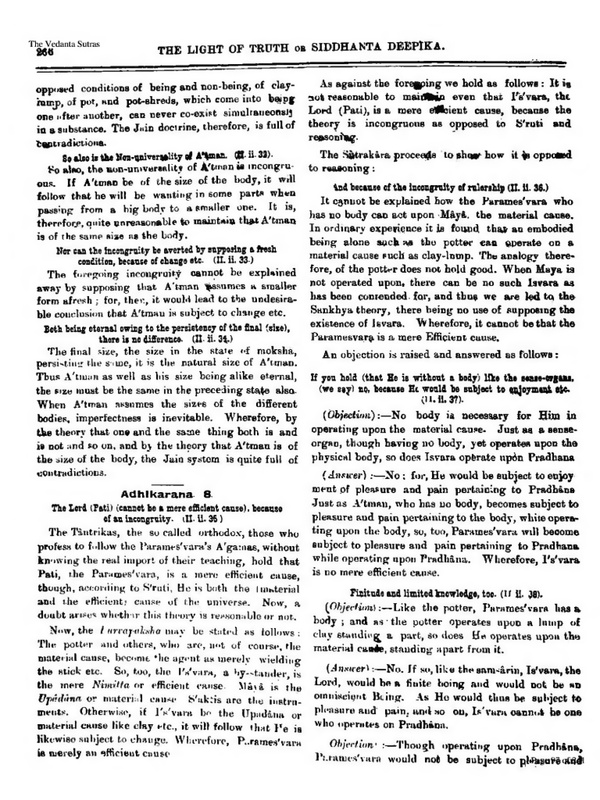 The Tantrikas, the so-called orthodox, those who profess to follow the Parameshwara Agamas, without knowing the real import of their teaching, hold that Pati, the Parameshwara, is the mere efficient cause, though, according to Shruti, he is both the material and the efficient cause of the universe. Wherefore we maintain that this adhikarana refers to the Yoga-Smriti of Hiranyagarbha which speaks of Ishwara as the mere efficient cause. Therefore the adhikarana is properly intended to overthrow the Hiranyagarbhagama. My question is about the two belief systems that Srikantha discusses. First of all, who are those "so-called orthodox" followers of Shaiva Agamas who believe that Ishwara is not the material cause of the Universe? Is this a reference to the Lakukisha's sect of Pashupata Shaivism, or Abhinava Gupta's sect of Kashmir Shaivism, or some rival sub-sect of Shaiva Siddhanta? Second of all, is it true that the Yoga school, which was founded by Brahma or Hiranyagarbha as described in the Mahabharata, believes that Ishwara is the efficient cause of the Universe? It certainly believes that he's not the material cause, since it posits Pradhana/Prakriti as the material cause? But I'm not aware of any statement in the Yoga Sutras that says Ishwara is the efficient cause. I've just seen statements like the notion that he's the first teacher of Yoga, the notion of worshipping Ishwara, and the notion that he dwells within everyone. For those who aren't acquainted with this philosophical terminology, the material cause of something refers to what it's made of, and the efficient cause of something is what causes it to happen. So "Brahman is the material cause of the Universe" means that everything is made of Brahman, and "Brahman is the efficient cause of the Universe" means that everything that happens is directed by Brahman. According Siddha Tirumular, a saint who has written Tirumantram, important text of Shiva Siddhanta, Maya is material cause, the Lord is efficient cause and His cit/sakti is the instrumental cause. Not the answer you're looking for? Browse other questions tagged philosophy yoga vedanta brahma-sutras shaivism . Why does some devotees clap at Lord Chandikeshwara? How do Dvaitins interpret the Brahma Sutras where it says Brahman is the material cause of the universe?